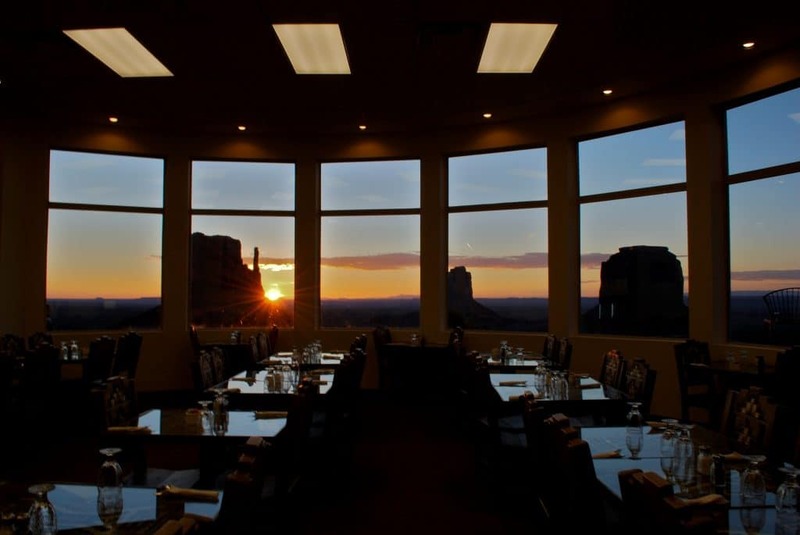 With a great expanse of windows looking out into the grandeur of Monument Valley, The View Restaurant offers breakfast, lunch and dinner from a complete menu of Navajo inspired dishes and classic American cuisine created by our Navajo cooks. Enjoy your meal and the breathtaking views—and be sure to bring your camera. Entrance to the restaurant is via the second floor foot bridge or through the courtyard or observation patio. Start your day with the breakfast buffet, which offers a hearty selection of everything from eggs, potatoes, biscuits and gravy, bacon, sausage and pancakes to assorted fruits, muffins, yogurt, cereals and juice. Lunch offers burgers, sandwiches and salads. 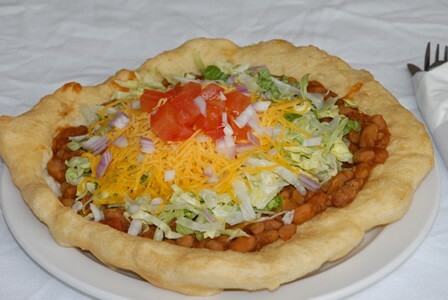 Try our Navajo Taco sampler or enjoy a piece of blue-corn Navajo fry bread drizzled with honey. You’ll notice that many of our entrees are named for Navajo residents or Hollywood actors who helped make Monument Valley famous—like the half-pound John Wayne burger. For dinner, try a Navajo Taco or our famous Green Chile Stew. The View also serves steaks and chops—seasoned a cooked to perfection. We pride ourselves in using the freshest ingredients. Though we offer a wide selection of salads and fruits, we are happy to prepare entrees to suit the needs of vegetarians or vegans. Every season from January 15 to March 1, the breakfast will be a complimentary continental breakfast. Lunch will be a limited menu. The View Express is adjacent to the restaurant and offers deli sandwiches, hot and cold food to go, as well as cold drinks and ice cream. Beer & Wine are not allowed to be sold within the Navajo Nation borders. Since the Navajo Nation is a dry nation, The View Restaurant offers non-alcoholic beer and wine. The Navajo Taco sampler plate has four mini tacos with miniature Navajo frybreads that have all the taste, without the size. Topped with fresh vegetables when available from the nearby school garden and mild green chili it is a perfect starter you won’t find anywhere else in the world. Red Chili Posole is a New Mexico Tradition. 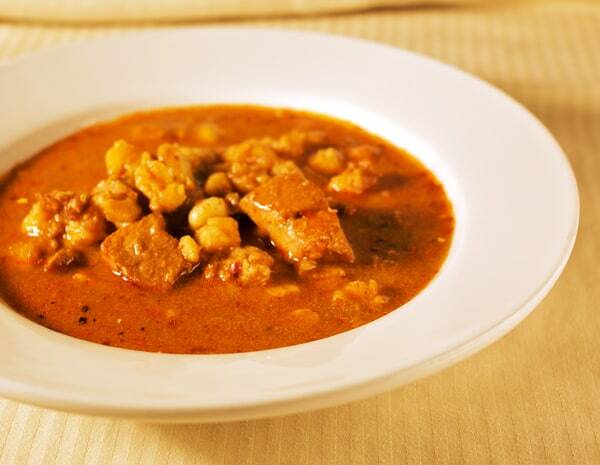 If you haven’t ever tried it, this mild Posole is made with generous chunks of tender pork and soft buttery hominy. Match it with a piece of frybread and you will be fueled for an afternoon exploring the Valley.